I'll just put it our there - I don't know how to do a lot of stuff. I never played sports, nor was I a very adventurous youth, so I completely lack athletic skills. I'm not a very good cook. I constantly set stains into clothes by running them through the dryer. But the things I do know how to do, I'm pretty good at. And the vast majority of them I learned without the benefit of a professor, a coach, or Martha Stewart - I did have the help of my kids, though. Thanks for the inspiration, Mama Kat - check out her writer's workshop, where one of the prompts today is "list 10 random things you know how to do." Now it's your turn - what are some random things you know how to do? Did you get your "mad skillz"* because of your kids - or in spite of them? *Another thing I can't do is slang. Great list, Robyn. Loved the Target, the saliva-grooming (I think a visibly dirty face is worse than a germy one), and making a lunch out of your kids scraps like a homeless person. Ah, motherhood! HA! Numbers 6 and 7 sound WAY too familiar. We don't get nearly enough recognition for all the ways we learn to do things just by improvising! That's true - improvising and flexible thinking are real skills, aren't they??? Not skills we get paid for, but skills none the less. I'm gonna start saying it too - before you know it, it'll be a thing! I'm pretty sure there's some kind of mind control device that's activated by Target's automatic doors. MUST BUY ALL THE THINGS! Hahha 3 is good. We used to be so good at talking in front of/about the boys without them relaxing we were talking about them. It's such an awesome tool to have at your disposal - but with every child there's the last time you can use it. The time they understand you. Dun dun dunnnnnnn! I have mastered the art of driving anywhere in town without passing a Tim Horton's doughnut shop. Great post! I made PBJ today for lunch because I was craving it and I knew if get the crusts. Plus it's a well known fact that scavenged food has no calories. Since the crust is brown, it's healthy, right?? I can carry 2 screaming children across a parking lot while smiling snarkily at strangers. Not a talent I ever expected to have. Love it! I was just lamenting #6 this morning. Someday I shall have my own meals again and be allowed to eat them in peace. Dare to dream. Not only that, but we might get to eat foods with sauces, and spices, and bits of herbs that (gah) might be vegetables! Being a mom is like being a superhero with magical powers. That's why it's awesome... sometimes. That's exactly right - because x-ray vision would be awesome, too! Until you walk by the YMCA locker room on senior citizens' day - and then, not so awesome. So glad to hear it - thanks! My best skill? Being the only person in the house that doesn't get accused of eating the rest of the Oreos, when I did indeed eat the rest of the Oreos. I bow down before your greatness, oh Oreo one. You must teach me the ways of blame deflection! My husband and I can both appreciate #3. We can still spell out words, but I will have to come to you in a few years to learn the ever powerful "cookie look." I can empty the dishwasher in peace because I routinely "forget" one large spoon that my son then "steals" and makes a mad dash away from me with his treasure. All I have to do is repeat, "Come back here with my spoon!" about 30 times. I'm actually eating muffin bottoms and apple skins right now!! I think the only thing missing is Assemble toys, Lego and Transformy like things with Ikea key tool. Love this list! And so true. I know how to clean an entire house with baby wipes. 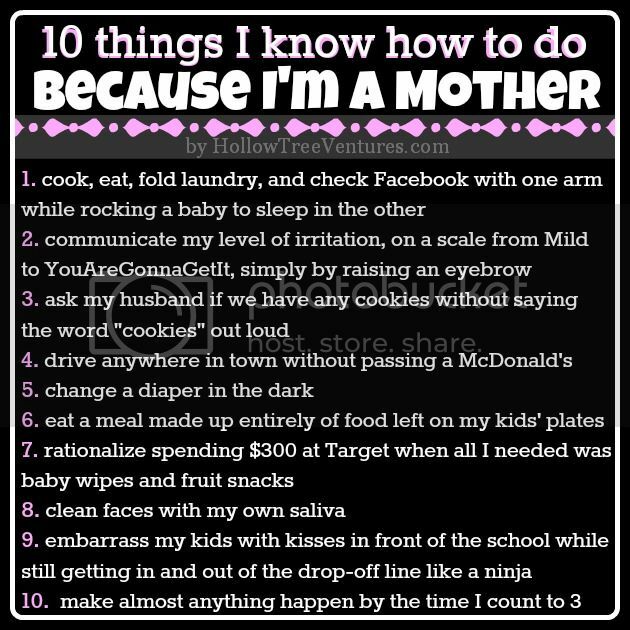 And how to take a shower, get dressed, and pack lunches in the amount of time it takes my kids to watch an episode of Super Why. Genius! Is there anything baby wipes can't clean?